THIS ITEM IS NOT AVAILABLE AT PRESENT. WE WILL NOT BE GETTING ANYMORE Star Wars Episode VII - The Force Awakens Kylo Ren Rule the Galaxy 20 Ounce Tritan Water Bottle. From the Star Wars The Force Awakens collection by Silver Buffalo. 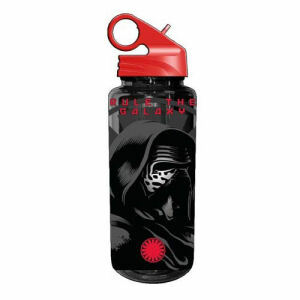 Star Wars Episode VII - The Force Awakens Kylo Ren Rule the Galaxy 20 Ounce Tritan Water Bottle. The water bottle comes with flip up built-in straw. Hand wash only. Not dishwasher safe. Do not microwave. Silver Buffalo Star Wars Water Bottles shipping from Canada. No Surprise Border fees or Customs!